"The Blair Witch Project in snowy conditions"
Many of you may have probably heard of the “Dyatlov Pass Incident”. Back in 1959 a party of ten skiers took off on a camping trip in Russia’s Ural Mountains, nine of them never returned. On the night of February 2nd, members of the party supposedly ripped open their tent from the inside and wondered into the snow, wearing nothing other than what they were wearing to bed, leaving their shoes behind. Three weeks later, five bodies were found not far from the camp and it wasn’t until several months later the remaining four bodies were found. Tests on their clothes found high levels of radiation and subsequent examinations of the bodies showed fractures to the skull, broken ribs and that one of them was missing their tongue. There was no real closure to this mystery, which obviously sparked a lot of conspiracy theories. Chilling stuff ay? And what a perfect set up for a horror film… let’s say… a story about a documentary crew investigating the mystery of the Dyatlov Pass Incident? Oh and look… there’s our title! Like most Found Footage/Mockumentary films, the story is pretty simple; a group of people go out looking for the truth, they find more than they bargained for, all they can do now is document everything… And that’s the synopsis… along with the majority of films in the same sub-genre. Don’t get me wrong, I am a sucker for Found Footage, ‘The Blair Witch Project’ being my favourite horror of all time (Yeah, you read that right). This particular Found Footage horror is directed by Renny Harlin, you know, the guy who directed the not-so-great ‘A Nightmare on Elm Street 4’, the pretty good ‘Die Hard 2’, ‘Cliffhanger’, the cheese-ball ‘Deep Blue Sea’ and the OTHER rubbish prequel to the ‘Exorcist’… ‘Exorcist: The Beginning’. Okay, so that’s not a GREAT filmography, but it’s not as bad as some directors’. 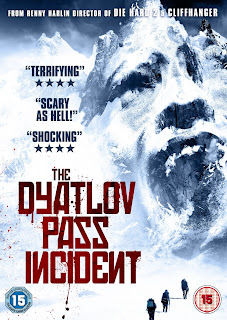 ‘The Dyatlov Pass Incident’ is pretty much ‘The Blair Witch Project’ in snowy conditions, and that’s not necessarily a bad thing (I say as a fan of Found Footage). Leading the crew up the mountain is Holly (Holly Goss, yeah, I don’t know who she is either), unfortunately, the character feels extremely stale, but it isn’t enough to ruin the movie. Other crew members consist of Jenson (Matt Stokoe, from ‘Hollow’… If you haven’t seen that film, keep it that way), Denise (Gemma Atkinson, from ‘Hollyoaks’), JP (Luke Albright) and the annoying jock-type character, Andy (Ryan Hawley). As far as acting goes it’s nothing impressive, but I have seen a lot worse, and the friendly banter between the group often feels genuine. The true story behind the Dyatlov Pass Incident is an extremely scary one, and it really makes your mind wonder. The setting is beautiful during the day and the evening. However, it’s when the sun goes down that you feel the isolation, the sense that no one would hear you scream. The first sign of unusual goings on is the discovery of big footprints outside their tents, and so the arguments begin; “You made these footprints for your film!” and “It’s a yeti!” You know, the usual. Obviously the situation starts to get worse, they find certain body parts and more interesting discoveries (I’m not going to spoil it for you now am I?). After what I can only describe as a terrifying and intense avalanche experience, everything starts to unravel… and things just get plain weird. There is a lot of inspiration from Spanish horror ‘[REC]’, with moments where the characters are being guided purely by the night-vision on their camera. ‘The Dyatlov Pass Incident’ isn’t a bad film at all; it’s interesting seeing Harlin’s take on the mystery, despite it being completely over the top. The film also has its jumps and scares, however, the only thing it is lacking is a bit more realism. Seeing as the sub-genre is way over used these days, it’s refreshing to watch one that doesn’t leave you frustrated or dizzy. Unfortunately, the film is let down by some poor CGI and a plot that throws too much in your face at once. Having said that, ‘The Dyatlov Pass Incident’ is a good film, nothing more, nothing less, but it is hard to believe that this is the story behind the true events… actually, it’s IMPOSSIBLE to believe, but it’s imaginative and leaves you with a final image that is sure to send that cold shiver down your spine.